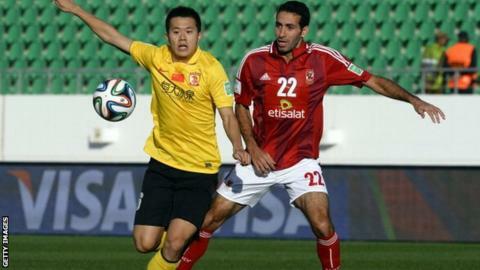 African champions Al Ahly lost 2-0 to Chinese side Guangzhou Evergrande in the quarter-finals of the Fifa Club World Cup in Agadir, Morocco. Brazilian Elkeson and Argentine Dario Conca grabbed second-half goals as the Egyptian side were eliminated. The Asian champions, coached by Italian World Cup winner Marcello Lippi, face European champions Bayern Munich next. The second semi-final will see Copa Libertadores winners Atletico Mineiro take on home side Raja Casablanca. Elkeson opened the scoring for Guangzhou in the 49th minute, slotting home from close range after fellow Brazilian Muriqui's shot came off the post. Muriqui missed a chance to add a second moments later, sending a shot just wide, but was involved when they did double their advantage on 67 minutes. Al Ahly goalkeeper Sherif Ekramy could only parry his drive into the path of Conca and the Argentine midfielder, who will leave the Chinese champions to return to Brazil's Fluminense at the end of the tournament, slotted home from close range. It could have been a very different story if Ahly had made the most of chances early in the game, with Mohamed Aboutrika heading over just five minutes in after a poor clearance was crossed into the penalty area. Bayern Munich are favourites to lift the trophy in Marrakech on December 21, with the Bavarians aiming to secure their second piece of silverware under Pep Guardiola after beating Chelsea in a penalty shoot-out to win the Uefa Super Cup in August.